I had my first taste of Fernet Branca several months ago, when I noticed a bottle at the liquor store, and the name rang a bell. Only when I got home did I discover what I was remembering was the Hanky Panky, a drink that required a mere two dashes of the stuff. I opened the bottle, took a whiff, and nearly fell over. This was one of my first encounters with an amaro, and what a place to start. I dared a small sip, and let’s just say, I was not ready. My tongue could not even begin to parse the flavors that were running riot in this deep dark spirit. No wonder. Fernet Branca is a secret blend of over 40 herbs and spices. A grape base is infused with ingredients that include aloe, chamomile, cardamom, myrrh, gentian root, cinchona bark, orris root, zedoary, and saffron and then fermented for a year in oak barrels. Fernet Branca was created in 1845 as a medicine by self-taught apothecary Bernardino Branca. It’s been touted as a cure for everything from indigestion to colicky babies. His daughter-in-law, Maria Scala, hit upon the strategy of marketing it as a relief for menstrual discomforts, and for years, advertisements displayed women drinking the amaro. Today it’s a favorite digestif, and a popular hangover cure. I have used a dash or two of the Fernet Branca in a few drinks. I’ve treated it as a non-potable bitter akin to Angostura, not a drinkable amaro. Straight, I find the mix of flavors in Fernet to be just too overwhelming and noisy. There’s also a strong medicinal aftertaste I find almost unbearably unpleasant. But Wayne Curtis’ recent article in the Atlantic inspired Chez Two at the Most to give this bitter drink another try. Reading about the San Francisco bar tradition of chasing a shot of Fernet with ginger ale, Bryan experimented with adding ginger syrup and soda water. Fill rocks glass with ice, add Fernet and syrup, top with soda water. The ginger is strong enough to stand up to the Fernet and bring the flavors into balance. It still allows the complex flavors of Fernet to shine through. Particularly interesting are some of the woodier herbs. The aftertaste is also mellowed considerably. 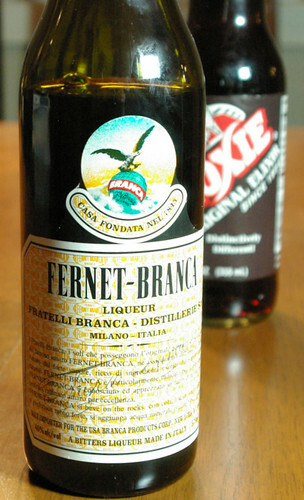 The Wayne Curtis article also mentioned the popularity of Fernet Branca and Coca-Cola (Fernet con Cola) in Argentina. I gave this combination a try, but it was surprisingly unpleasant. 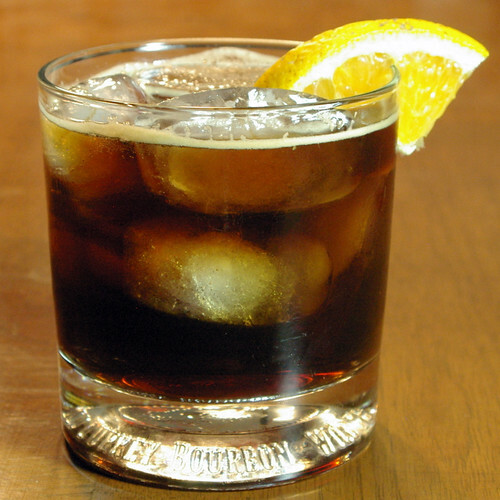 The Coke and the Fernet just clashed, creating an unpleasant, artificially metallic flavor. Adding more Coke did little to make it better. I wondered if it wasn’t a case where the use of high fructose corn syrup in US Coke meant it didn’t work as well as Coke made with cane sugar, as it would be in Argentina. On my next visit to the store, I looked for some cane sugar cola, which was surprisingly difficult. There were at least ten different speciality root beers, but I only found one cane sugar cola drink. This was Moxie Original Elixir. This particular soda seemed a great choice to try with the Fernet, as it also has gentian root. And I was not disappointed. This really is a fantastic mixer with the Fernet. I found the resulting drink to be honestly refreshing. The flavors mixed well, in a very complimentary manner. I was astonished that just two ounces of Moxie made a full ounce of Fernet quite drinkable for me. Fill rocks glass with ice. Pour in Fernet Branca. Top with Moxie Original Elixir. Give a quick stir. Garnish with orange slice. My conclusion is that when using Fernet as a key ingredient in a cocktail, it’s important to find something that can both stand up to and blend with the Fernet. It may seem counter-intuitive at first, that the way to address too much flavor is to add more flavor. But finding complimentary flavors turns an assault on the palate into a more subtle dance. I think you might be right about the sugar in the cola — that possibility hadn’t occurred to me. Of course, it hadn’t even occurred to me to mix Fernet and cola either (Argentina: mysterious), and I certainly wouldn’t have thought to mix Moxie and Fernet for the reasons you put forth. But I’ve got a case of Moxie in the closet, and after I finish this cup of coffee I’ll break out the Fernet and give it a try. P.S. I once made up a forgettable cocktail involving Moxie, but only because I wanted to named a drink “The Moxie-Contin.” Your post has encouraged me to resume the experiment. I’ve heard that Fernet Branca is now available in the States. Which liqueor store did you find it? I’ve had an amazing experience where Fernet Branca helped me to get through a multi-course Chef’s table dinner at the Dining Room at the Woodlands (here’s my write up of it – http://5starfoodie.com/profile.asp?ResID=25). Thanks! Cane sugar Coke (also known as Mexi-Coke) should be fairly easily available in the Mexican groceries. It always intrigued me that both Fernet and Coca-Cola are rumored to have originally contained cocaine, and that they are a popular mix in Argentina. The Argentine Fernet plant makes a significant portion of the total production. I am so tempted to steal that name for a cocktail of my own! In the past couple of months, Fernet has gone into fairly wide distribution in the Washington State Liquor Stores, and even has a permanent looking position next to Campari in my nearest store. I’m one of those who tend to say “cola” as the generic, where others may say “soda” or “pop.” You’re right, kola doesn’t seem to be a flavoring in Moxie.